Ray tracing is the most essential general-purpose rendering technique available. It is not the only rendering technique, nor is it the fastest, but it is the most accurate and can be the most photorealistic. It is one method within a continuum of methods of rendering a computer-generated image, but it has revolutionized rendering for art, gaming, engineering, and architecture. 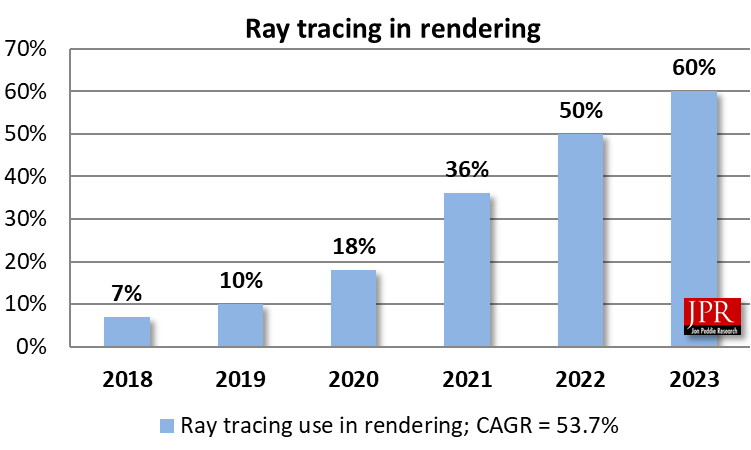 Written for anyone who wants to learn about the ray tracing market, this report discusses the suppliers, the programs, and the technology. This report is not intended as a tutorial on ray tracing mathematics or physics, or how to use ray tracing software. It includes marketing data to help people interested in the technology understand the positioning of the many suppliers in the field who will affect the way the rendering market will develop in the future. And it includes some historical backgrounding to explain how technology has gotten to this point of being a core piece of the rendering process and as a basis for our predictions of the future of rendering. Ray tracing isn’t just about shiny surfaces; there are all types of uses for and styles of ray tracing; one researcher likens it to writing because it can accommodate a wealth of different styles.